Savrasov in his work assigns a separate place to depict the landscapes of spring. There are works through which the master tells the viewer about the infinite joy of nature, which awakens. And there are such pictures in which the deep sadness and feelings of the author are hidden. 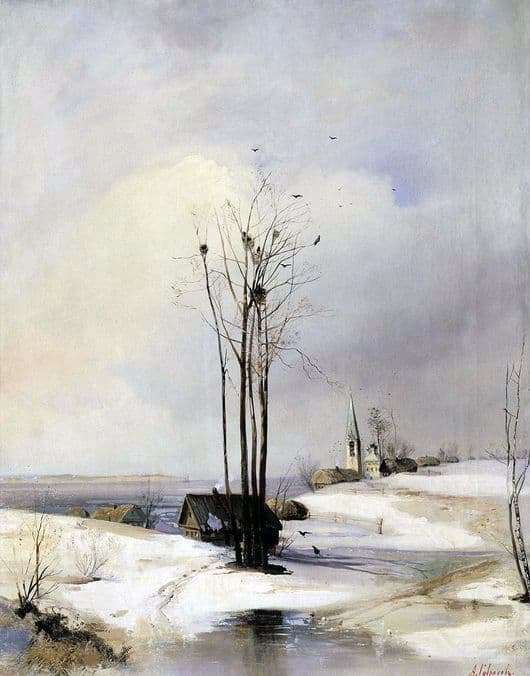 Just one of these works, filled with the deepest lyrical feeling, is a canvas called “The Thaw” or as it is called “Early Spring”, dated 1874. The plot of the picture is quite simple and has no hidden underlying reason. A plain opens before the spectator, which is still covered with a snow blanket. The air is still quite cold, despite the imminent approach of warming. In the foreground one can see several poor village houses, behind which, a little further, stands the white village church. Sky, while it seems endless from its dullness. Despite this, one feels like a barely noticeable whiff of the spring breeze is already rolling across the cold plain, but these blows already open areas of the soil can be seen and the trees began to wake up. With the onset of spring, migratory birds began to return, who sat down on the treetops and spoke with all their appearance about the arrival of spring. This work surprises with its piercing and spirituality. Savrasov managed quite warmly and so at home to fulfill the story of the spring in this picture. The master not only copied nature and transferred it to the host in an instant, he conveyed to us all his experiences, which he felt, and which nature felt. Despite the predominance of gray and languid shades, the master very finely draws all the lines and thus performs a pictorial solution.